As you may have gathered from my last post, I was rather happy to see the back of Copenhagen. We were up and out of the most undesirable camping ground to ever exist at 7am and it was going to be about a 7 hour drive to Oslo. As we crossed the Swedish border, we had received a big Scandinavian welcome in the form of a $173 toll for the privilege of crossing the border. I’m pleased to report this time we drove through in the correct lane. Goal achieved!We were rather famished by this time and were keen to pull up somewhere to make coffee and breakfast. The place that presented itself was McDonalds. The carparks are spacious so we parked Scarlett, turned on the gas and went about boiling water for coffee, and making porridge, all the while watching people go through the drive-thru for their McDonalds. I must say I was rather pleased with our efforts. After very little sleep from the windy night before, the drive was taking longer than anticipated, and by the time we got to Gothenburg (about 4 hours in to the drive) we were hungry and sleepy. I Googled a park that we could pull up to, we made some lunch, had a 20 minute power nap and a brisk walk up a hill and were ready to go again. I absolutely love being in an RV! To be able to pull up anywhere, make some food, have a nap and then walk the 4 steps back to the drivers seat is pretty awesome! As we entered Norway we were stopped at border, questioned about our intentions and our passports were checked. Interestingly he couldn’t care less about whether we had a driver’s license or not. Norway is an incredibly green and environmentally friendly country. This means fuel is expensive, there are a gazillion tolls and plenty of electric cars getting around.Norway has a free camping law. The law allows you to have unrestricted access to national parks, public land and countryside. We thought about trying to free camp but the rules are a little different for motorhomes, or camping cars as the Europeans call them. We did some research on where to stay and it looked like a lot of the camping grounds were closed for the low season… oh dear. Luckily I have data and was able to find a decent looking campground that is open all year round. I am so grateful that my lovely friend and tech whizz, Bridgette, recommend I get a 3 Mobile UK sim card and posted the one from her recent travels to me while I was in Hervey Bay. The sim allows you to have “all-you-can-eat” data for 20 pounds a month in selected countries. That’s right, data roaming at that price! The catch is the credit card you use has to be registered to a UK address. Thank you to my cousin David who lives in England for taking care of that for me! On our trip the countries included are Denmark, Sweden and Norway and it’s been a huge savior so far. We have been able to research places and campgrounds on the fly and use Google maps. I have a feeling if I had put some extra credit on the account in Germany we may not have to spend the night at the Ibis Hotel… live and learn! We stayed at Bogstad Camping about 9km from the city. The campground was lovely, it also had cabins and is just 3kms from one of the big ski grounds. Of course being Norway, it was over $50 per night night and showers were the equivalent of about $3 each for 5 minutes. It’s completely worth it thought, Norway is just so beautiful. 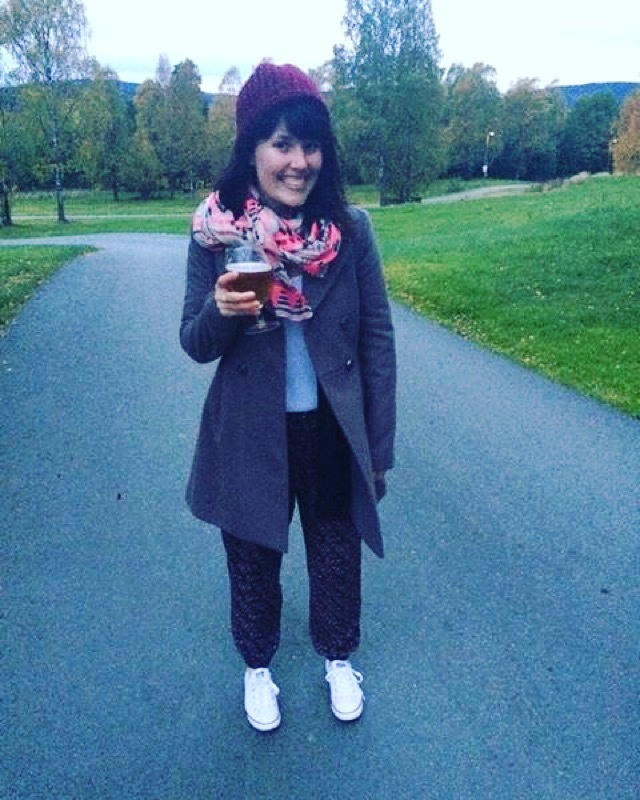 I felt at home and was rugged up with a beer at 5pm. Happy to be in Norway! On Thursday we took the bus in to town and started wandering around the city. We stumbled upon a castle with a great view and after reading the sign I commented to Brad “oh it says this is their Ministry of Defence? Surely that’s not the case now” as we freely walked around buildings and took photos. After this we set out to find Viking Biking, a guided city biking tour that had excellent reviews on Tripadvisor. When we arrived the guy at the shop, Curtis, had an American accident… interesting. He was a super personable guy and informed us that the tour started at 1pm (it was currently 11am), he gave us a map and pointed out some must-sees of Oslo that weren’t on his tour. The two things we picked to check out were the National Ballet and Opera house and the food hall. Curtis was extremely excited about the Opera House. He was saying it won the best new building award in 2008 and is so fabulous etc etc. He then asked us where we were from. When we said Ausralia, he said “okay, it’s the second best Opera House in the world” so I was expecting great things. We got there, and here it is…. I appreciate it’s very Scandinavian. These are progressive cities, relatively new cities compared to rest of Europe and they are willing to take risks but to me it looks like a concrete jungle. Reminds of the Queensland University of Technology really. What do you think? After the Opera House it took awhile for us to find the food hall as a result of some wrong turns and confusing streets. The best part that came out of that walk was when someone on the street went “Brad? !” and it was a Norweigan woman that Brad had met while volunteering in Nepal. This is what I absolutely love about travelling. Here we are on the other side of the world, and without any prior planning or communication, you can run in to someone you know while wandering the streets of Oslo. They caught up for a few drinks that night while I caught up on some cleaning and sleep. I was super thankful for being a nanna when Brad had a sore head and was a lot poorer the next day, and I was spritely and rubbing it in his face. Needless to say I did most of the driving on Thursday. When we eventually found this mysterious food hall, we were starving and settled on a delicious looking pie and a pale ale, we are on holidays after all! It was only when we were sitting down to dig in to said pie that we realised we paid $25. Yes people, the equivalent of 25 Australian dollars on a lackluster pie that didn’t even come with tomato sauce. All the reading and research I had done went on and on and on and on about how expensive Norway is so I was prepared for it to be expensive. I even read a passage of the New York times 36 hours, 125 weekends in Europe that said “the first thing people will say to you when you mention that you are going to Norway is that it is really expensive. The second thing they will say in Noooo, I mean reaaallly expensive” yep okay, I completely understand now! Because it took us so long to find the food hall, we decided to order an Uber to make it back to the tour on time. The Uber arrived, an electric Volkswagen Golf with a driver named Svein. Brilliant. What wasn’t brilliant is how quick it was to get back. We had obviously taken the REALLY long route in search of the food hall. On the tour we had our tour guide Curtis who is from the USA but has lived in Norway for a number of years, 2 Americans, 1 French Canadian, 2 New Zealanders (our favourites) and us. The tour went for three hours and we cycled to the old castle, Akershus Gestning where Brad and I had visited that morning and guess what? It was the Ministry of Defence. Curtis summed it up it up perfectly “Guess what people? We are cycling and taking in the view of Norway’s version of the Pentagon.” This is where it become very apparent that the Norwegians are very trusting bunch. Also included on the tour was City Hall, where the Nobel Peace Prize is announced, and was announced the day we did the tour and to the Royal Palace, Vigeland Sculpture Park (rather weird and unique) and to the modern harbour of Tuvhomen. 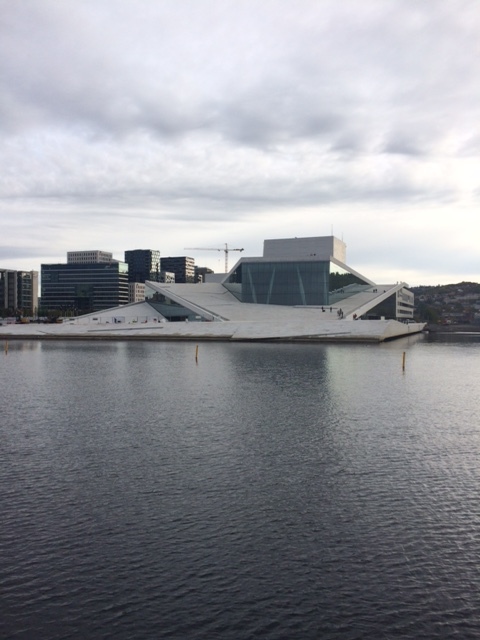 It was a fun and affordable way to see the beautiful Oslo in a day. On Friday morning we walked from our campsite up to the famous skijump, ran the ridiculous stairs and prepared Scarlett for the possibility of free camping. I.e draining the black water, filling her back up with fresh water and making sure we had plenty of gas and petrol. As we got in to Notodden, about 2 hours north of Oslo, we lost our nerve to free camp and stayed at a self-reliant campsite on the water. There was a nice view, but it was quite basic and the amenities were far away, you had to pay for them and our water in the RV stopped working! In the morning we were starting to get worried about the water not working and the pump wasn’t turning on. We were reading manuals and online forums and not having much luck. We were getting pretty frustrated (because we couldn’t boil water for our coffee or breakfast!) so I went and asked some of the older people camping if they knew what it could be. Two German men suggested a fuse and that the fuse box might be under the bed. So Brad and I spent the next 40 minutes trying to find this fuse box. The manual said ‘in the passenger console’ so I was on all fours looking everywhere under the passenger seat, under the bed, in all the nooks and crannies and no luck. After awhile I could see one of the men pretending to just go for a stroll I knew he wanted to check up on us without being too forward. This is hilarious because I wanted to invite him in to the look at the problem but also didn’t want to be too forward. I opened the door and said we were still having issues; he came over, opened the driver’s door, looked under the seat and said, “see, broken fuse.”OMG. We hadn’t checked under the driver’s seat. He said “fuse box under driver’s seat in my RV. All Dethletts the same.” Then it dawned on me that Dethletts is a UK brand so therefore right hand drive, meaning in the UK the fuse box would be under the passenger seat but of course in Europe, it’s the driver’s side. Brad replaced the fuse, we thanked the man profusely, and happily waved to him, his buddies and their wives, who were waiving back and giggling as we drove up. Yep, silly Australians once again! The drive from Notodden to Oslo was filled with very narrow, winding roads but it was so picturesque, having to really concentrate and drive slowly was a welcome task. We even saw snow! 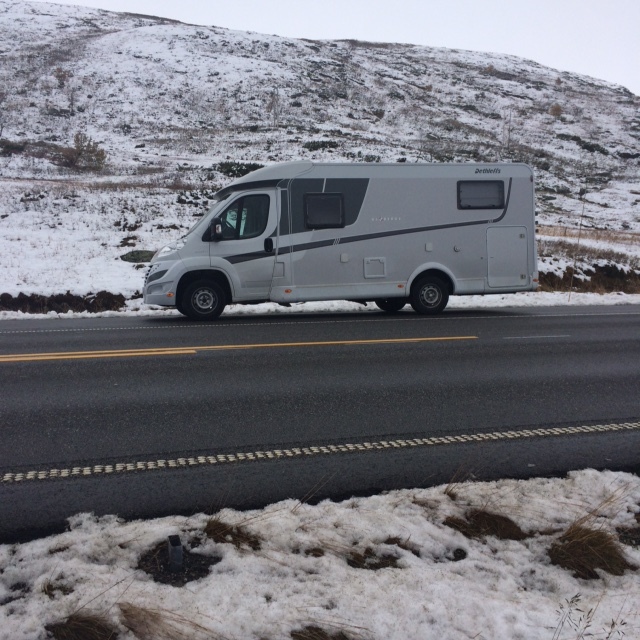 Scarlett having a break in the snow on the way to Odda! Ahhh the left vs right hand side drive. Love the bit about the man going for a walk to check up without being too forward. That is classic. Somethimg I would definitely do. Love the opera house. Very Scandinavian!